Facts about Dwarf caiman crocodilia. "Scientific name for Dwarf caiman crocodilian is Paleosuchus palpebrosus". Dwarf caiman is a small crocodilian which belongs to the alligator family and is native to central and northern South America. However, the Dwarf caiman crocodilian can also be found inhabiting most parts of , Colombia, Paraguay, Bolivia, French Guiana, Brazil, Ecuador, Guyana, Venezuela, Surinam and Peru. Some of the common names of the Dwarf caiman crocodilian species include the dwarf caiman, the musky caiman, the smooth-fronted caiman and Cuvier's caiman. 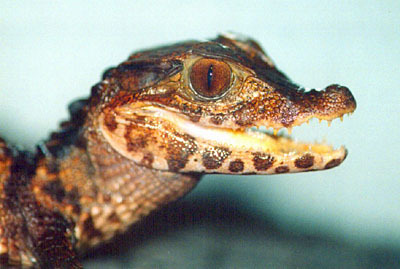 It is also referred to as the wedge head caiman by the pet trade. The Dwarf Caiman crocodile was previously described as the smallest New World crocodilian by Georges Cuvier, a French zoologist in the year 1807. The crocodile species and the P. trigonatus species are the two remaining species in the genus Paleosuchus with the other breed species being the closest relatives of the caimans in the subfamily Caimaninae. Estimated population in the wild is about 1,000,000. The male Dwarf caiman crocodilian can grow to maximum lengths of about 5 feet (1.5 meters) while the female species can develop to about 4 feet (1.2 meters) in length and rarely six feet (1.8 meters). It is important to note that the Dwarf caiman crocodilian is not only the smallest living species of the caiman and the alligator family, it is also the smallest in of all the crocodilian species with weights ranging from approximately 13 to 15 pounds (6 to 7 kg) which is similar to the weight of a twelve month old juvenile of the larger crocodilian species. The head of the Dwarf caiman crocodilian has an unusual shape which resembles the head of a dog and comprises of a concave, smooth short snout with an upturned tip and a dome-shaped skull. The upper jaw of the Dwarf caiman crocodilian extends uniformly further forward than the lower jaw with fourteen to fifteen maxillary teeth on either side of the jaw, four pre-maxillary and twenty two or twenty one teeth on both sides of the jaw. The dorsal scutes of the Dwarf caiman crocodilian are less prominent than in the fronted- smooth caiman. Its neck is relatively slender. The Juvenile Dwarf caiman crocodilian mostly feeds on diets which are rich in invertebrates and sometimes frogs and small fish. However, the adult species feed on larger amphibians, invertebrates like huge molluscs and fish. The Dwarf caiman crocodilian usually creates burrows in order to shade itself during the day. The hatching period of the Dwarf caiman crocodilian takes approximately three months before they hatch. The female crocodile species usually buries the eggs on a mounded nest. Upon hatching, the mother Dwarf caiman crocodilian aids the hatchling to escape from the nest providing care for its offspring for the first few weeks. The female Dwarf caiman crocodilian will lay from from 10 to 30 eggs and the incubation period lasts around 115 days. Juveniles are brown in color with blank banding. Adults are darker. The young-lings head is chocolate brown, with an iris color to match. The Dwarf caiman crocodilian lower jaw is streaked with white bands. Caimans will reach sexual maturity when they become about 5 years of age and they will stay sexually active untill they are about 15 years old.